Yesterday Julie Bort wrote in the NetworkWorld site an interesting post called “Cisco doesn’t contribute nearly enough to open source”, where she contends that “”[despite its] .. proclaims it responsible for a half percent of the contributions to the Linux kernel (0.5%). In reality, Cisco has been a near non-entity as an open source contributor”. Of course the author is right in its claims – the amount of contributed code to the Linux kernel is substantial but very “vertical”, and specific to the needs of Cisco as a Linux adopter. Which is a perfectly sensible thing to do. The problem of “contribution” comes up and again in many discussions on open source and business adoption of OSS; it is, in fact, a source of major debate why participation is low, and what can be done to improve it. It is my opinion that there are some barriers to OSS contribution – namely, internal IPR policies, lack of understanding of how participation can be helpful and not just a gift to competitors, and more. On the other hand, two points should be made to complement this view: the first is that some companies contribute in ways that are difficult to measure, and the second is that sometimes companies have no economic reasons to do so. In fact, I would say that some aspects like Artwork, Marketing and Quality Assurance may even be more important than pure coding – the problem is measuring such contributions. While the technical work underpinning source code analysis is quite well researched (among others, in our FLOSSMETRICS project) there is NO research on how to measure non-code contributions. And such contributions may be hugely important; one of my favorite example is the release, from Red Hat, of the Liberation fonts – a set of fonts with metrics compatible with the most widely used Microsoft fonts, like Arial. That alone helped substantially in improving the quality and correctness of document editing and visualization on Linux. How to measure that? Ubuntu has substantially contributed in terms of dissemination, in creating a base for many other distributions (including our own Everydesk). How to assess the value of that? The second aspect is more complex, and is related to the strategy and tactics that a company uses to fulfill its own goals. Let’s take into account what a normal company do: first of all, survive (that is, revenues+reserves>expenses). Not all companies do have such a goal (a company designed to fulfill a task and then end its activities does have the survival goal with a deadline) but most do. This means that a company performs an internal or external activity if it does provide, now or in the future, a probable increase in revenues or reserves, or decreases expenses. Moral or ethical goals can be easily modeled in this schema using a “ethical asset”, that is a measure of how good we are in a specific target environment; for example, ecological contributions and so on. So, let’s think about our typical company using OSS for a product. Let’s imagine that the company is doing a tactical adoption, that is it does not have a long term strategy that is based on Open Source. If the cost of contributing something is lower than the cost of doing everything from scratch, then the company will contribute back (or at least, the probability of that action is higher). In absence of a strategy based on open source, there is no need to go further. For example, in the blog post the open sourcing of IOS is mentioned; the question is: why? What economic goal this open sourcing brings? If the company decides to adopt a long term strategy based on resource sharing (with the idea of receiving substantial contributions from external entities – like Linux, WebKit, Apache, and so on) then this may make sense; but it implies a substantial change in company strategy. Such large changes are not easy to do and perform well; Sun tried (and partly failed), and most of the “famous” examples are only partially adopting an open-based strategy (IBM, Oracle, Google). To recap: 1) we must evaluate and appreciate all kind of contributions – not only code. 2) We can expect large scale contributions only from companies that bet their strategy on OSS – Red Hat is among my favorite examples of that. We cannot expect, realistically, for companies that are using Open Source in a tactical way to contribute back in the same way. which, I believe, matches quite well Matthew’s idea about OSS4.0. One area where I am (slightly) in disagreement with Matthew is related to licensing; I am not totally sure about the increased success of non-copyleft licenses in this next evolution of the open source market. Not because I believe that he is wrong (I would never do that – he is too nice ) but because I believe that there are additional aspects that may introduce some differences. What we found is that for non-market sponsors and new code, there is an higher development activity from outside partners for code that is released under a non-copyleft license. But this implies that the code is new and not encumbered with previous license obligations, like for example the reuse of an existing, copyleft-licensed project. 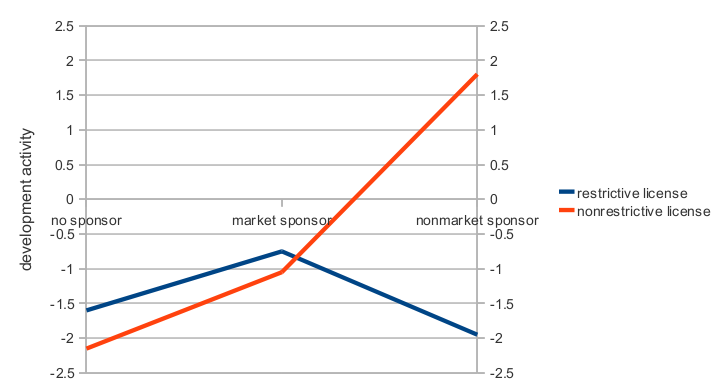 The graph shows the impact on development activity in open source projects, depending on license restrictiveness and the kind of “sponsor”, that is the entity that manages a project. “No sponsor” is the kind of project managed by a non-coordinated community, for example by volunteers; “market sponsor” are projects coordinated by a company, while “nonmarket sponsor” are project managed by a structured organization that is not inherently for-profit, like a development consortia (an example is the Eclipse Foundation). The research data identified a clear effect of how the project is coordinated and the kind of license; the license restrictiveness has been found to be correlated with decreased contributions for nonmarket sponsors, like OSS foundations, and is in general related to the higher percentage of “infrastructural” projects (like libraries, development tools, enabling technologies) of such foundations. When the project is derived from an external FLOSS project, then the main constraint is the original license. In this case, the basic approach is to find a suitable license from those compatible with the original license, and select among the possible business models the one that is consistent with the selected exploitation strategy. When one of the partners has an Intellectual Property Rights licensing policy that is in conflict with a FLOSS license, the project can select a MIT or BSD license (if compatible with an eventual upstream release) or use an intermediate releaser; in the latter case there are no constraints on license selection. If a MIT or BSD license is selected, some models are of difficult application: for example, Open Core and Dual Licensing are difficult to implement because the license lack the reciprocity of copyleft. When there are no external licensing constraints, and external contributions are important, license can be more or less freely selected; for nonmarket entities, a non-copylefted license gives a greater probability of contribution. So, if you are creating a nonmarket entity, and you are free to choose: choose non-copyleft licenses. In the other situations, it is not so simple, and it may even be difficult to avoid previous licensing requirements. The point on intermediate releasers require some additional consideration. An especially important point of OSS licenses is related to “embedded IPR”, that is the relationship of the code released with software patents that may be held by the releasing authority. While the debate on software patents is still not entirely settled, with most OSS companies vigorously fighting the process of patenting software-based innovations, while on the other hand large software companies defending the practice (for example SAP) most open source licenses explicitly mention the fact that software patents held by the releasing authority are implicitly licensed for use with the code. This means that business practices that rely on separate patent licensing may be incompatible with some specific OSS licenses, in particular the Apache License and the GPL family of licenses. The Eclipse Public License gives patent grants to the original work and to enhanced versions based on the original work but not to code not directly derived from the release, while permissive licenses like BSD and MIT give no patent rights at all. If, for compatibility or derivation, a license that gives explicitly IPR rights must be selected, and the company or research organization wants to maintain the rights to use IPR in a license-incompatible way a possible solution may be the use of an intermediate releaser; that is, an entity that has no IPR on its own, to which the releasing organization gives a copy of the source code for further publication. Since the intermediate release has no IPR, the license clauses that require patent grants are not activated, while the code is published with the required license; this approach has been used for example by Microsoft for some of its contributions to the Apache POI project. This may become an important point of attention for companies that are interested in releasing source code under an OSS license; most software houses are still interested in maintaining their portfolio of patents, and are not willing to risk invalidation through “accidental licensing” of IPR embedded in source code (one of the reasons why Microsoft will never sell a Linux based system). As I wrote in the beginning, there is for a large number of consortia a clear preference for non-copyleft licenses; but it is not possible to generalize: the panorama of OSS is so complex, right now, that even doing predictions is difficult. One of my recurring themes in this blog is related to the advantages that OSS brings to the creation of new products; that is, the reduction in R&D costs through code reuse (some of my older posts: on reasons for company contribution, Why use OSS in product development, Estimating savings from OSS code reuse, or: where does the money comes from?, Another data point on OSS efficiency). I already mentioned the study by Erkko Anttila, “Open Source Software and Impact on Competitiveness: Case Study” from Helsinki University of Technology, where the author analysed the degree of reuse done by Nokia in the Maemo platform and by Apple in OSX. I have done a little experiment on my own, by asking IGEL (to which I would like to express my thanks for the courtesy and help) for the source code of their thin client line, and through inspecting the source code of the published Palm source code (available here). Of course it is not possible to inspect the code for the proprietary parts of both platforms; but through some unscientific drill-down in the binaries for IGEL, and some back of the envelope calculation for Palm I believe that the proprietary parts are less than 10% in both cases (for IGEL, less than 5% – there is a higher uncertainty for Palm). If we add the proprietary parts and the code modified we end up in the same approximate range found in the Maemo study, that is around 10% to 15% of code that is either proprietary or modified OSS directly developed by the company. IGEL reused more than 50 million lines of code, modified or developed around 1.3 million lines of code. Without OSS, that would have costed more than 2B$, required a full staffing of more than 700 people for an effort duration of more than 20 years. Through OSS, the estimated cost (using the more appropriate semidetached model) is around 90M$, with an average staffing of 150 people and an estimated project duration of 5 years. Palm has a similar cost (the amount of modified code is quite similar), but starting from a smaller amount of reused code (to recode everything would still require 12B$, 570 people and 18 years of work). We have to add some additional costs (for an explanation you can check my previous post on the proper use of COCOMO II and OSS, using the model by Abts, Boehm and Bailey) that would bring the total cost to a little less than 100M$ (still substantially less than the full cost of development from scratch). Open Source allows to create a derived product (in both case of substantial complexity) reducing the cost of development to 1/20, the time to market to 1/4, the total staff necessary to more than 1/4, and in general reduce the cost of maintaining the product after delivery. I believe that it would be difficult, for anyone producing software today, to ignore this kind of results. Addendum: I received some requests for specific parts of source code from people willing to check the kind of modifications performed. For Palm, the website provides both original source code and patches. For IGEL, I requested the access to the source code, and was kindly provided with a username and password to download it. Since the single most requested file seems to be the modified rdesktop, I have linked the GPL sources here. It is now time to write the closing part of our long multi-part look at open source business models. After all the discussion on how to look at the various parts of a model and how to improve it, I will try to summarize a bit on how to look at an OSS business model, and what implications can be made from a specific choice (for once, without mentioning open core). There are two possible sources for the value: a property (something that can be transferred) and efficiency (something that is inherent in what the company do, and how they do it). With Open Source, usually “property” is non-exclusive (with the exception of Open Core, where part of the code is not open at all). Other examples of property are trademarks, patents, licenses… anything that may be transferred to another entity through a contract or legal transaction. Efficiency is the ability to perform an action with a lower cost (both tangible and intangible), and is something that follows the specialization in a work area or appears thanks to a new technology. Examples of the first are simply the decrease in time necessary to perform an action when you increase your expertise in it; the first time you install a complex system may require lots of effort, and this effort is reduced the more you experience the tasks necessary to perform the installation itself. Examples of the second may be the introduction of a tool that simplifies the process (for example, through image cloning) and it introduces a huge discontinuity, a “jump” in the graph of efficiency versus time. Among the results of our past research project, one thing that we found is that property-based projects tend to have lower contributions from the outside, because it requires a legal transaction to become part of the company’s properties; think for example at dual licensing: to become part of the product source code, an external contributor needs to sign off his rights to the code, to allow the company to sell the enterprise version alongside the open one. On the other hand, right-handed models based purely on efficiency tends to have higher contributions and visibility, but lower monetization rates. As I wrote many times, there is no ideal business model, but a spectrum of possible models, and companies should adapt themselves to changing market conditions and adapt their model as well. 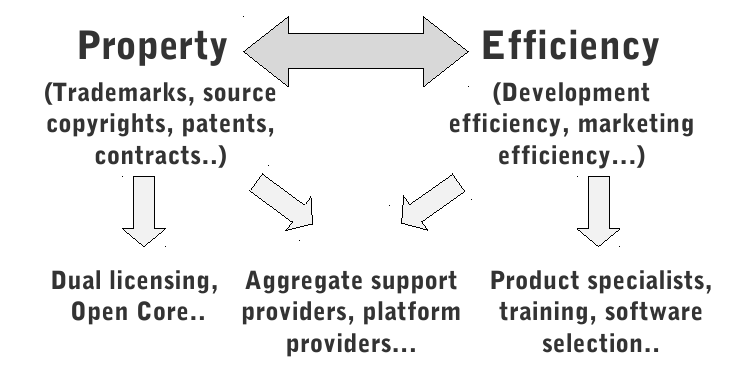 Some companies start as pure efficiency based, and build an internal property with time; some others may start as property based, and move to the other side to increase contributions and reducing the engineering effort (or enlarging the user base, to create alternative ways of monetizing users). This is the last post in our little mini-serie on OSS business models; I hope that my archetypal three readers will have enjoyed it as much as I enjoyed writing them. Of course, I will be happy to read and respond to any comment – even negative ones. 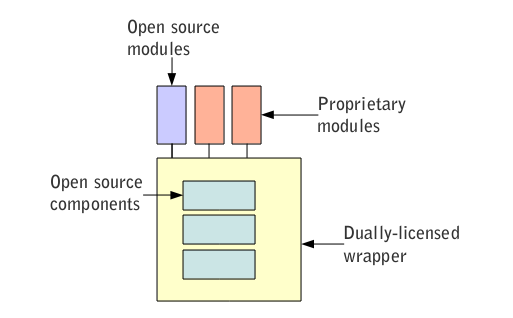 Open core is usually built by a set of internal open source components held together by a dual-licensed wrapper, plus proprietary modules on the outside. One of the best examples of this is Zimbra (an excellent product on its own) but MySQL in recent editions can be included in the same group. As discussed in previous posts, dual licensing hampers contributions because it requires an explicit agreement on ceding rights to the company that employs it, in order to be able to relicense it for the proprietary edition. This means that Open Core companies, in itself, will have an easier time in monetizing their software, but will receive much less contributions in exchange. As I wrote before, it is simply not possible to get something like Linux or Apache with Open Core. Again: open core is not bad per se (but I would have been more cautious in calling Sugar “an open source company”, for whatever definition you have of that). But it is a tradeoff: monetization versus contributions. And, my bets are on contributions, as OpenStack demonstrates – you need leverage and external resources to go beyond what a single company can do. Companies using OC are not the devil, and should not be called names because of their choice of business model. Actually, there are no good and bad business models - only models that work, and those that do not. So, if open core works for a company, that’s a good thing. Open core models are somehow confusing for adopters. As a consultant for more than 100 companies and public administrations, actually explaining open core is one of my most common tasks. And the marketing message of companies is confusing: if you go to the Zimbra webpage (no offence against Zimbra, which is a company/product I love and use as example of good practice) you see the phrase “Zimbra – the leader in open source email and collaboration”, not “Zimbra – the leader in open source and proprietary email” (not that the phrase would win any context ) and the same for all the other open core companies. This is not, in my opinion, such a negative point if the website explains the difference between versions in a simple way, as for example both Zimbra and Alfresco do. It is true that open core models tend to have a higher revenue than non-OC models. It is also true that OC does have an intrinsic limited number of contributions from outside (as we found in FLOSSMETRICS analysing a few hundreds packages), and as can be found in the mentioned LinuxTag presentation. So, you may have higher monetization ratio, but you basically forfeit external contributions. The CEO should decide what is more important – so the decision is not “ethical”, but practical and based on economics. You will never get the kind of participation that Linux, Apache and Eclipse do have in an Open Core model. If that is ok for you – that’s great. The fact that most VC are funding open core companies is just a data point. Lots of open source companies do well without VC funding. It is true that lots of people claims that “pure” open source models are not sustainable. Even my friend Erwin Tenhumberg (that is quite knowledgeable, expert and incredibly nice on its own) had a slide in this sense in his LinuxTag presentation; and you can find lots of comments like that in many publication (something like “the majority of OSS companies adopt the so called mixed model”, despite this being actually false, as we found in our survey of OSS companies). The point, like said before, is that the important thing is not that there is a superior model, but that for every company, every market there is an optimal model – it may be OC, it may be pure services, or lots of combinations of our 11 building blocks. The optimal model changes with time and market condition, and what is appropriate now may be wrong tomorrow. No open source model can achieve the kind of profit margins of proprietary companies. So, if you want to make your OSS company, remember this basic fact. If you want the kind of profit margins of Microsoft or Oracle, forget it. So, to end this post, there are three critical points: whether the model is clear for the adopter (and this should be a given, and actually nowadays I would say that most companies are absolutely honest and clear on this), whether the software in its open source edition provides sufficient functionality to be useful to a wide range of adopters (and this is a fine line to walk, and requires constant adaptation) and whether the increased monetization compensates for the lack of external contributions, that can substantially increase the value of the code base (you are trading cash for code and engineering, in a sense). (part five of an ongoing series. Previous parts: part one, two, three, four). Marten Mickos (of MySQL fame) once said that “people spend time to save money, some spend money to save time“. This consideration is at the basis of one of the most important parameter for most OSS companies that use the open core or freemium model, that is the conversion rate (the percentage of people that pays for enterprise or additional functionalities, versus the total amount of users). With most OSS companies reaching less than 0.1%, and only very few capable of reaching 1%, one of the obvious goals of CEOs of said open source companies is to find a way to “convert” more users to paying for services, or to increase the monetization rate. My goal today is to show that such effort can have only a very limited success, and may be even dangerous for the overall acceptance of the software project itself. efficiency (work done in the unit of time) does have a lower bound of zero, and an higher bound that depends on many factors; efficiency can vary by one order of magnitude or more. Another important parameter is the price per hour for having something done. At this point, there is a common mistake, that is assuming that there is a fixed hourly rate, or at least a lower bound on hourly rate. This is clearly wrong, because the price per hour is the simple ratio between what someone is paying you to do the work and the amount of time required for that action; so if no-one pays you, that ratio is zero. So, let’s imagine someone working for a web company, and one of the activities requires a database. Our intrepid administrator will start learning something about MySQL, will work diligently and install it (ok, nowadays it’s nearly point-and-click. Imagine it done a few years ago, with compiles and all that stuff). This system administrator will never pay for MySQL enterprise, or whatever, because its pay is fixed, and there is no allocated budget for him to divert money to external entities. So, whatever is done by MySQL to monetize the enterprise version, there will be simply no way to obtain money from the people that is investing time, unless you sabotage the open source edition so that you are forced to pay for the enterprise one. But what will happen then? People will be forced to look at alternatives, because in any case time is the only resource available to them. This basic concept is valid even when companies do have budget available. Consider the fact that the average percentage of revenues invested in ICT (information and communication technology) by companies is on average around 5%, with some sectors investing slightly less (4%) up to high-tech companies investing up to 7%. This percentage is nearly fixed, valid for small to large companies and across countries and sectors; this means that the commercial OSS company is competing for small slices of budget, and its capability to win is related mainly to the perceived advantages of going “enterprise” versus investing personnel time. make sure that people knows about the commercial offering. This can be performed “virally”, that is by creating an incentive for people to share the knowledge of your project with others, which is very fast, efficient and low-cost; however, this approach does have the disadvantage that sharing will happen within a single group of peers. In fact, viral sharing happens within only homologous group, and this means that it is less effective for reaching those users that are outside the same group – for example, the non-users that we are pointing at. This means that purely viral efforts are not capable of reaching your target – you need to complement it with more traditional marketing efforts. Next: resource and development sharing, or how to choose your license depending on your expectations of external participation. Welcome to the fourth part of our little analysis of OSS business models (first part here, second part here, third part here). It is heavily based on the Osterwalder model, and follows through the examination of our hypothetical business model; after all the theoretical parts, we will try to add a simple set of hands-on exercises and tutorials based on a more or less real case. We will focus today on the remaining parts of our model canvas (with less detail, as those parts are more or less covered by every business management course…), and will start a little bit of “practical” exploration, to create the actors/actions model that was discussed in the previous instalments. Cost structure: this is quite simple – the costs incurred during the operation of our business model. There are usually two kind of models, called “cost-driven” (where the approach is minimization of costs) or “value-driven” (where the approach is the maximization of value creation). Most models are a combination of the two; for example, many companies have a low-cost offering to increase market share, and a value offering with an higher cost and higher overall quality. In open source companies it is usually incorrect to classify the open source edition as “cost-driven”, unless a specific price and feature difference is applied between a low-level and high-level edition. Key partners: do our company partners with external entities? Common examples are resellers, external support providers, and so on. Additional examples may be partnerships with other companies or external groups for co-development of the OSS components (even competitors may share work on improving a reciprocally useful OSS package); sometimes the partnership may be informal (for example, with an OSS community) but fundamental as well. Key activities: what is the basis of our work in our hypothetical OSS company? Of course, software development may be a big part; other examples are marketing, support… every company do have a specific mix, that is easily recognized simply by looking at what each person inside the company is doing right now. Channels: how do we contact our customers, or potential ones? Directly? Through an external channel? Each channel provide different properties; web marketing is different from web word-of-mouth, exactly like radio advertising is different from print advertising. Choosing an appropriate channel is adifficult art, and is something that changes with time. Revenue streams: this is easy! How the money enters your company? Is it structured in one-time payments, multiple recurring payments? Are there alternative form of revenue? Are you still with me? Now that you have collected all the data on your company, the fun begins. We need to draft the network of actors (like your key resources, customer segments, external contributors…) and link these actors together with their relationship and effect. Some relations may impact on specific variables while changing others (lowering the attractiveness of the community edition may increase conversion rates, but lower overall adoption rates). In the next instalment we will provide an initial draft, and will later show how to convert this graph into a small and simple simulation.